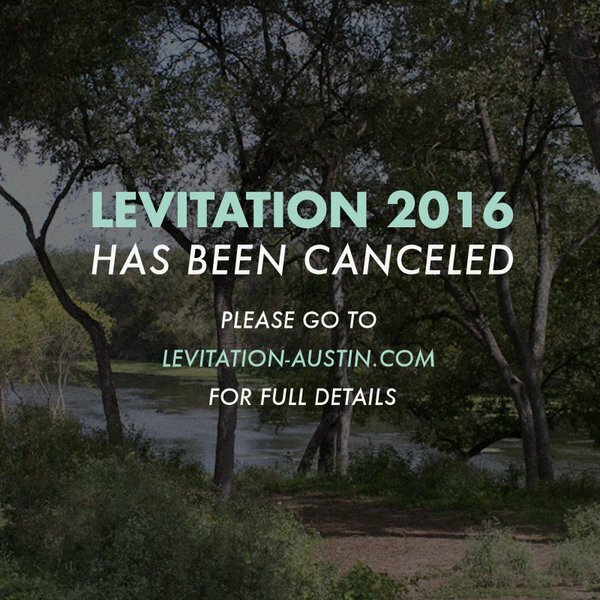 Due to safety concerns regarding dangerous weather, Levitation 2016 has been canceled. This decision is heartbreaking, but it’s a decision officials have made for the safety of festival attendees, and safety is our first priority. We’ve been working with county officials trying to find a way to carry on, but at this point the decision has been made, and it is beyond our control. The cancellation is due to dangerous weather conditions in the forecast combined with weather complications to the grounds and the Colorado River. We are completely devastated. We have been working for a year, looking forward to this weekend and seeing you all at the ranch. We know that many of you traveled from far away, and that this news is extremely disappointing for everyone. At this point, the projected impact of the storms has intensified, and we are now left with no choice but to cancel. You may remember that in 2015 we had severe weather warnings as well, but were able to get through the weekend. The difference between 2015 and 2016 is the severity of the storms being predicted, including high wind, large hail and tornado warnings, combined with high water levels from last week’s flooding. We have tried every avenue to continue with the festival, and the county has been working with us to find a way, but today at 5:00pm the final decision was made to cancel the festival due to public safety concerns related to severe weather. Following this announcement, the festival has to evacuate the site, meaning that staff and equipment must be loaded out. This leaves us with no opportunity to continue the festival later in the weekend. Even if the weather has improved drastically on Sunday, we would be unable to produce an event at the ranch. We will be working to keep everyone updated. Please see information on refunds, potential venue shows and other important info below.